Check out these new and used Eddie Boyd vinyl records LPs for sale. Eddie Boyd was born on a plantation in Mississippi in 1914. He learned to play piano and guitar, and his piano playing was influenced greatly by Leroy Carr. Boyd moved to Memphis around 1936 and began playing with a group called the Dixie Rhythm Boys. He eventually made it to Chicago in 1941 and recorded for Bluebird Records, initially backing up great artists like Muddy Waters and Sonny boy Williamson. Eddie Boyd began recording his own music and is responsible for one of the most iconic postwar blues standards titled Five Long Years. This song has been covered beautifully by Buddy Guy, Muddy Waters, BB King, and Jimmy Reed. Boyd actually funded the recording of the song himself and sold the track to JOB records. He went on to have other hits songs like 24 Hours and Third Degree in 1953. Eddie became tired of the discrimination towards African-Americans in the United States and ended up moving to Europe in the 60s. He continued to play throughout Europe until his death in Finland in 1994. 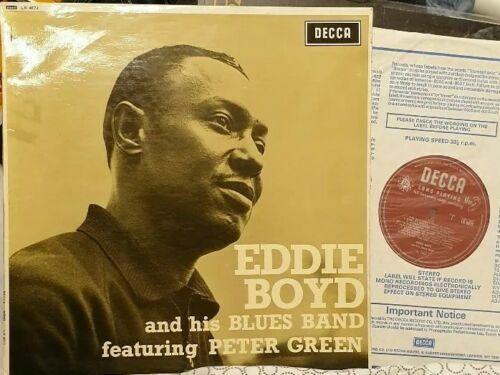 We recommend starting your Eddie Boyd vinyl collection with Eddie Boyd and his Blues Band with Peter Green (from Fleetwood Mac) originally released on Decca in 1967. Our inventory is constantly changing, so check back often, or browse our list of vinyl from blues musicians.